Hidden behind Brooklyn's wellness studio and cafe HealHaus, you'll find yoga and meditation classes beneath the billowy curtains of this pretty pink patio. You'll find yoga and meditation classes on this pink patio hidden behind Clinton Hill wellness spot HealHaus. Feeling like you’re not in the middle of New York City can be difficult when you’re in the middle of New York City. But this new pretty pink patio should do the trick. 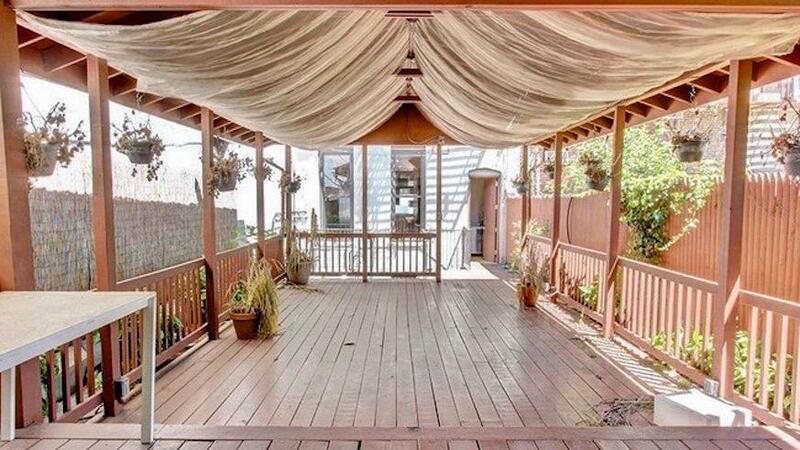 The backyard deck is the hidden secret of HealHaus, a new holistic wellness studio and cafe that just opened at 1082 Fulton St. in Clinton Hill. Part of any good wellness routine is connecting with nature, and this trendy pink patio is giving us all kinds of good vibes. Colors are said to have mood-changing powers, and pink is not just trendy — interior designers say the color is especially soothing, so it has actual wellness cred. As for what you’ll find under those billowy curtains, HealHaus is a self-described “healing space” with up to four daily classes combining yoga and meditation “that are unique and will help you realize that healing mind, body and soul is more than a trend, but a lifestyle,” says co-founder Elisa Shankle. To relax, there’s a cafe serving drinks developed by an herbalist and a physician like smoothies, coffee alternatives, elixirs and HealHaus’s own branded teas, plus a handful of health-conscious baked goods. Private practitioners will have use of two studios for alternative therapies like acupuncture and reiki. Workshops and discussions are also planned. Prices range from $18-$20 per class or monthly and annual memberships, with donation-based classes offered on weekends. This is just the first of a chain of HealHaus locations, according to the founders, who also plan to offer retreats around the world. HealHaus is open daily. The cafe’s hours are 7:30 a.m. to 6 p.m.; classes are held from 7:30 a.m.-7:30 p.m.